Oltremare is a popular perfume by Bois 1920 for women and men and was released in 2011. The scent is fresh-citrusy. It is still in production. John's 45 years old. Family man and husband of a wise and charming wife. He lives in a lush condo, drives a Mercedes. The desire of his childhood. John's a creature of habit. The wild times are definitely behind him. John's motto is consistency. He's conservative and doesn't think much of change. Not in his daily routine, either. He gets up, has breakfast and washes himself. His wife's been giving him the same perfume for a decade. Fresh and discreet. He was never a big fan, but he got used to it. And he doesn't want to complain either. Stress with his wife is the last thing he needs in this stressful time. In addition, the fragrance suggests the kind of expression he can use in his managerial role as an auditor. The fragrance serves its purpose. John goes to work and soberly realizes that the day will be like any other. The habit may be beautiful, but the boredom has not let him go for a long time. John used to go to sports. He was fit. Today we see a place of prosperity and disenchantment. On the way back, John drives into town. John has to get a present for his daughter. She'll be 15. Suddenly he takes a smell. Different, so different from his perfume. It pleases him and follows the smell. Later he stands in front of a perfumery and discovers the origin. It's Oltremare. Funny name, John thinks. Actually, he doesn't like it, but after a short test phase and the charming saleswoman, John takes it home with him. John puts on the scent and felt a change. He felt younger, fresher, energetic. He smelled of red tea, lemon, sandalwood. It smelled like the sea. That's where he's been wanting to go for a long time. His wife was thrilled, too. John made a completely different impression. The perfume created a completely new perception. Also his colleague associated again a lustful and other John. From now on John wore only oltremare. He was something special and finally he could escape the habit for at least a fraction of his time. Whenever a piece of sea blew through his nose. I believe that the little story can show that perfume can be so individual, so divorced, that it can get us out of our everyday trot. Sometimes that has to be the case! Drink tea overseas, smell roses and simply be satisfied! No no, don't worry, I'm not sighing now, because I want to annoy you again with things like my single existence, fear of women's fragrances or a missed limited edition of Batman (which would be catastrophic by the way!!! 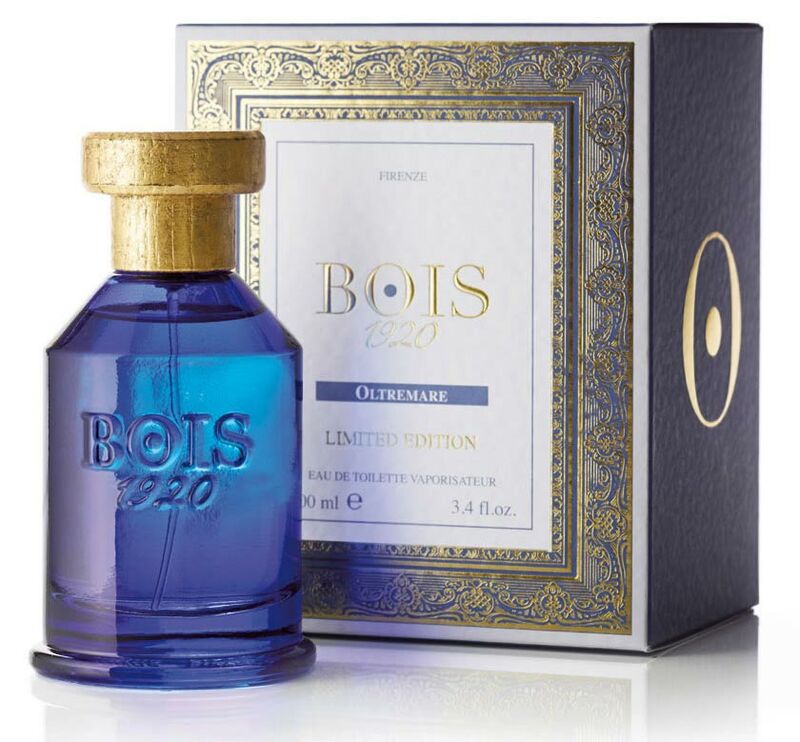 ), but because I would love to test these Bois 1920 fragrances so much, but I can't find them here anywhere. Even in a niche perfumery I was told that they didn't have these scents, so I'm all the happier when I get a sample of one of these scents, like this one here! Yes, Oltremare starts already once very beautifully! There are citric scents everywhere, but they are not yet very clearly distinguishable from each other. But I think that the bergamot is gradually crystallizing out of it. Then the rhubarb is added, which has a very refreshing effect with its citric and sour scent. In addition to the name there are also aquatic notes (but no salty notes), which are rather faint, but still fit perfectly to the rest of the fragrance. Then I smell a little roses with a sweetish background that probably comes from the violets. After a few minutes the great, citric notes unfortunately become weaker and weaker and disappear into the background, and with it the tangy sillage of the fragrance also sinks. This means that the best way to smell the citrus fruit is to smell it closer to the sprayed area. But well, the fragrance remains great, as I can smell nice, bitter notes now, of course especially because of the great tea fragrance. Although I recognise that this is clearly a beautiful tea scent, I cannot yet say with certainty whether it is also red tea. There are also light, woody notes and a slight but fine sweetness of amber. With time the tea gets a little stronger, which makes me happy :D And I think it is red tea now, because I can exclude green and black tea meanwhile. And so the fragrance remains until in the later base most fragrances slowly fade away and the fragrance then becomes a little more aquatic. Yes, the Sillage is still quite lively at the beginning due to the citric notes and can therefore be smelled well, but this moment lasts only a few moments, so that the fragrance loses its power quickly afterwards. Most of the time the scent is therefore unfortunately only moderately strong and will therefore only be smellable for a not too long time only from close up. The shelf life is okay for a fragrance that is fresh. You shouldn't expect much, but five or six hours is certainly in it. The bottle is cylindrical, with the upper part bending off and narrowing up towards the neck. Its dark blue colour looks very nice and the brand name has been incorporated into the bottle glass so that there is no label. The lid seems to be metallic (I suppose... as I said, I've never held a Bois 1920 flacon before) and cylindrical, with the upper part of the lid sitting on like a disc. Somehow a simple looking bottle, but still very beautifully made! Oh and although one can still smell a little roses at the beginning, I find the fragrance quite unisex, as the roses continue to wear off and are replaced by more bitter notes. From the type I would say that the scent is a spring and summer scent, because it smells fresh, light and loose. In addition, it would fly away quickly in the cold autumn and winter anyway, because unfortunately it doesn't have such a great Sillage. However, it is definitely worth testing! OLTREMARE - overseas. I am glad,that I have not know the meaning of this word, so my perception was not limited by preconception. It is hard to believe for me, that OLTREMARE would be a unisex fragrance, but even owners' composition shows, that it is rather popular amongst gentlemen as well. For my nose it is a flowery mixture, the star is hyacinth here, I could not relieve myself with help of tea, juniper berries or citrusses, I got only a healthy, strong, ruthless flower in my face. Such kind of feeling, as you would bathe in shower gel without water. You like the fragrance of the shower gel, but a half-filled tub with shower gel is too much for the senses. Heart and base are dry and scratchy, a bit more spicy than the top. I suspect that some of the notes eloped during filling the sample in the vial, so I got only the stronger and agressive part of the fragrance. Please confirm, that the juice in the bottle differs from my experience. A different take on the classic aquatics with the rhubarb. If you’re looking for something different this may be it.